These Brown Sugar Bacon Roasted Sweet Potatoes are perfectly soft and have a sweet and smoky flavor. These are a great side dish to any meal and are so simple to make. 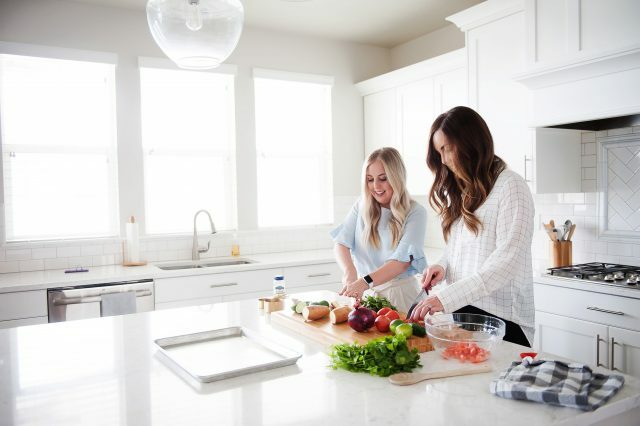 Sweet potatoes are one of my favorite foods because they are so versatile. My favorite dish at holiday dinners always have sweet potatoes in one form or another. Whether they are baked, roasted, mashed or covered in brown sugar and marshmallows, I’m sure to love them! I like that this recipe is easy to make and has so much flavor. By cooking the bacon at the same time as the sweet potatoes, you get a nice sweet and smoky flavor. The hardest part about this recipe is peeling and dicing the sweet potatoes. Besides that, you just mix everything together at once in a big bowl, pour it into a pan and let the oven do the work for you! Before you begin prepping everything, preheat your oven to 400 degrees F.
I started by peeling and cutting my sweet potatoes into bite-sized pieces. You could leave the potato skin on if you are short on time, but I prefer to remove it. 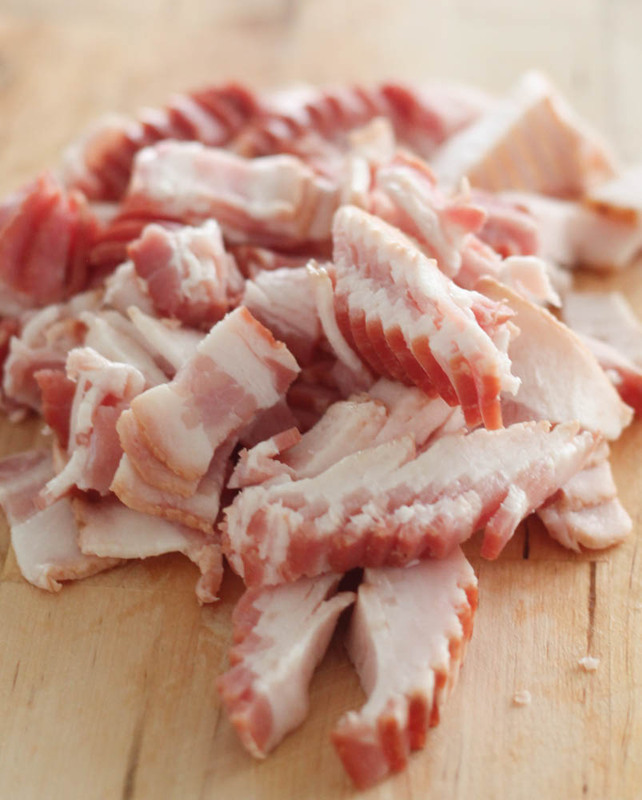 Next, I diced the bacon. It’s ok if the bacon isn’t all the same size. It will all crisp up when it bakes. Add the cut sweet potatoes and bacon to a large bowl. 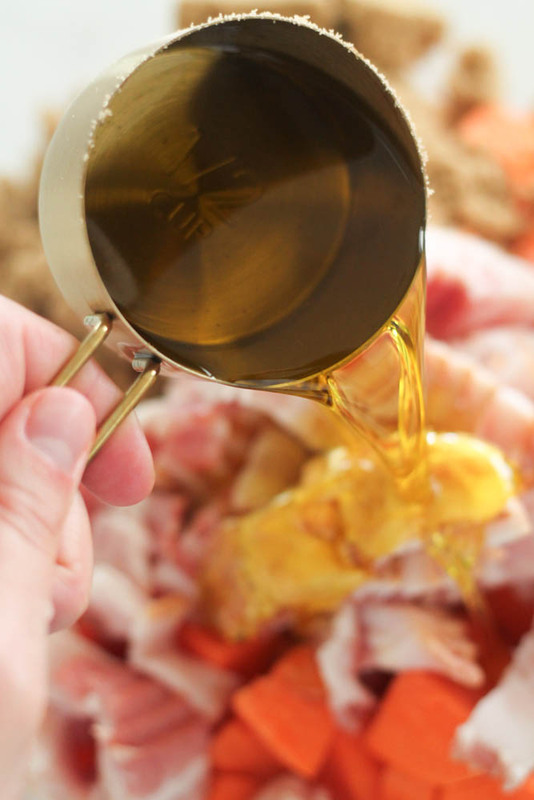 Add some brown sugar and toss everything in olive oil until everything is evenly coated. Spread the mixture out in a baking sheet lined with foil or a silicone baking mat for easier clean up. Place pan in preheated oven and bake for 20-25 minutes, or until sweet potatoes are tender and easily pierced with a fork. Use a slotted spoon to scoop sweet potatoes and bacon from the pan as there will be liquid and fat from the bacon and brown sugar. Place in a bowl and serve hot. How Do You Make Sweet Potatoes Crispy? These are a softer roasted sweet potato. If you would like your bacon and sweet potatoes to crisp up a little bit, turn oven to broil and let broil for 1-2 minutes, watching closely so nothing burns. Should Sweet Potatoes be boiled before roasting? By boiling your peeled and cut sweet potatoes before roasting, you will get a sweet potato that is crispier on the outside. Otherwise, just peeling, cutting and roasting sweet potatoes is fine. 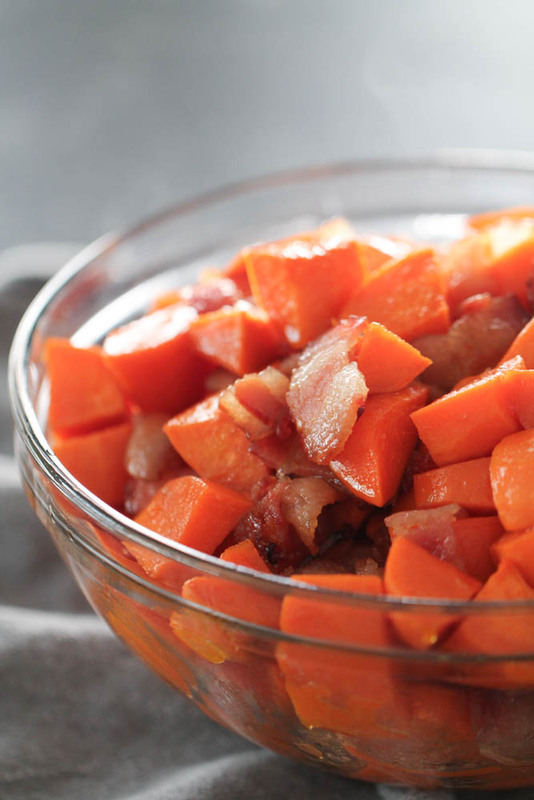 Tender sweet potatoes tossed with bacon and brown sugar for the ultimate side dish. Line a rimmed baking sheet with a silicone baking liner or foil sprayed with nonstick cooking spray. Cut sweet potatoes and bacon into bite-sized pieces. 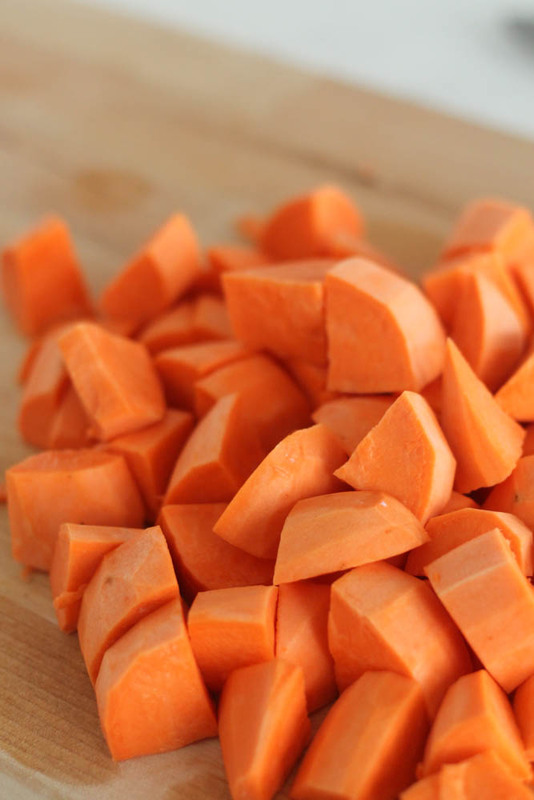 Combine cubed sweet potatoes, cut uncooked bacon, brown sugar, and olive oil in a large mixing bowl until well combined. 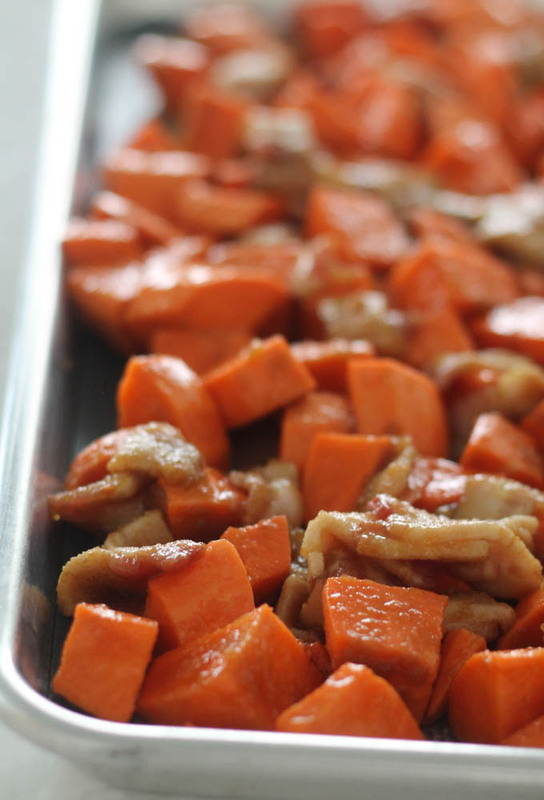 Transfer to prepared baking sheet and bake for 20-25 minutes, or until sweet potatoes are tender and bacon is crispy. Use a slotted spoon to scoop potatoes and bacon from the pan and into a serving bowl as there will be liquid from the bacon and brown sugar. If you think these Brown Sugar Bacon Roasted Sweet Potatoes are good, be sure to try our Easy Baked Sweet Potato Fries.